If security isn’t a big issue for you, configuring Windows 7 to logon to your user account automatically can save you some time when your computer is starting up. 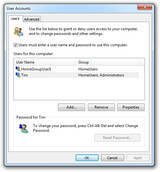 Just follow the tutorial outlined below to make Windows 7 automatically logon to your user account. When these steps are complete, Windows 7 will stop prompting for a user name and password when your computer starts up! This command will load the Advanced User Accounts Control Panel applet. In the Users tab, uncheck the box next to Users must enter a user name and password to use this computer. Click on the Apply button at the bottom of the User Accounts window. When the Automatically Log On dialog box appears, enter the user name you wish to automatically login to Windows 7 with. Then enter your account password in the two fields where it’s asked.Click the OK button. Click OK on the User Accounts window to complete the process.From now on, when your PC starts up, Windows 7 will log on automatically. How do I enable Automatic Logon in Windows 7 when I’m on a domain? Click Start, click Run, type regedit, and then click OK. In Windows Vista/7, simply typeregedit in Start Search and hit Enter. Double-click the DefaultUserName entry, type the user name to log on with, and then click OK. If DefaultUserName registry value name is not found, create a new String Value (REG_SZ)with value name as DefaultUserName. Double-click the DefaultPassword entry, type the password for the user account under the value data box, and then click OK. If there is no DefaultPassword value, create a new String Value (REG_SZ) withDefaultPassword as the value name. Note that if no DefaultPassword string is specified, Windows automatically changes the value of the AutoAdminLogon registry key from 1 (true) to 0 (false) to turn off theAutoAdminLogon feature. In Windows Vista/7, DefaultDomainName has to be specified as well, else Windows will prompt for invalid user name with the user name displayed as .\username. To do so, double click onDefaultDomainName, and specify the domain name of the user account. If it’s local user, specify local host name. If the DefaultDomainName does not exist, create a new String Value (REG_SZ) registry key with value name as DefaultDomainName. Double-click the AutoAdminLogon entry, type 1 in the Value Data box, and then click OK. If there is no AutoAdminLogon entry, create a new String Value (REG_SZ) withAutoAdminLogon as the value name. If it exists, delete the AutoLogonCount key. Click Start, click Restart, and then click OK.